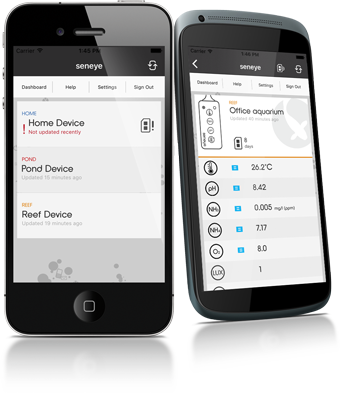 The Seneye V2 mobile app is available for all mobile and tablet platforms running iOS, Android or Windows 10. This includes major brands such as iPhone, Samsung, HTC and Nokia. Before you run the app we recommend that you first setup a seneye.me account so you can log in. If you use the app before you have a Seneye device and before it is fully synced you may wish to log out and log back in, this will ensure your mobile profile is up to date. If you don't have a smartphone or you have one we don't support then try m.seneye.me . To find out more about the mobile app click here. 24/7 continuous, auto refreshing data at your fingertips. Automatic slide activation using your phone camera or keypad. A new overview that shows you snapshots of all your devices. Monitoring for how many days your slide has left. Easy access to your seneye.me account. You can also view the full seneye.me site from all mobile, ipad and modern tablet devices that support HTML5. The Seneye Web Server interface is also compatible with all devices that support an HTML5 browser.